The Estimize consensus is calling for EPS of $0.05 and revenue of $1.8 billion, slightly lower than Wall Street’s bottom line estimate. What are you expecting for TSLA? Get your estimate in here! All eyes will be on electric car maker, Tesla (TSLA), on Wednesday afternoon as it reports its fourth quarter earnings.The Estimize community is calling for EPS of $0.05, 2 cents higher than Wall Street while revenue estimates of $1.8B are right in line with the Street. Ahead of Tesla’s earnings, the Estimize community has frantically dropped EPS estimates by 56% in the last 3 months, reflecting a bearish sentiment on the company’s ability to turn a profit in Q4. 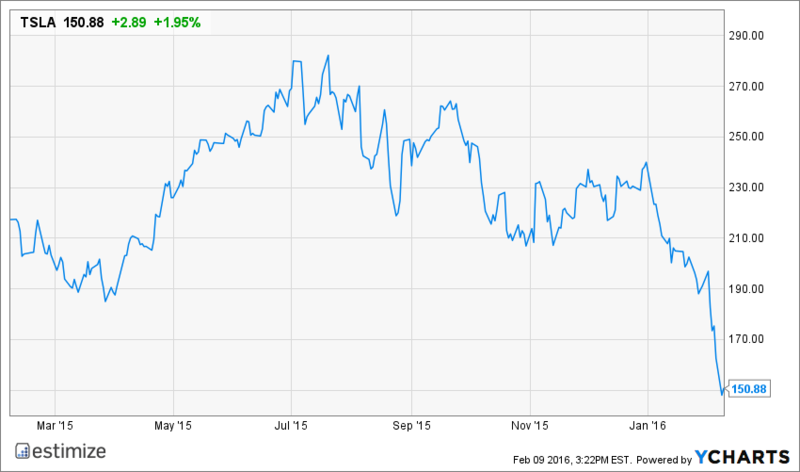 Sharing this belief, some analysts have recently downgraded Tesla from a hold to sell rating. The report follows a volatile year for the company which delivered record sales, yet saw its share prices tumble. Investors have grown increasingly concerned over both the short and long term outlook of Tesla and on the heels of its earnings report, share prices reached a 52-week low. The company’s over exuberance on car production and shipment guidance has contributed to the sell off we are seeing today. Long term investors fear that volatile macroeconomic conditions, including plunging oil prices are making electric car less attractive to consumers. This year Tesla delivered a record 50,000 vehicles but failed to meet volume expectations the company set earlier in the year. Consequently, shares of Tesla have plunged over concerns that the company won’t be able to execute on its ambitious growth plans. One of the main reasons Tesla hasn’t been able to deliver profit growth is because the company has been spending heavily. Given operating expenses account for almost 50% of the company’s revenue, missing volume forecasts put a severe damper on margins. Tesla has made large investments in launching its first SUV and building out a sustainable battery. 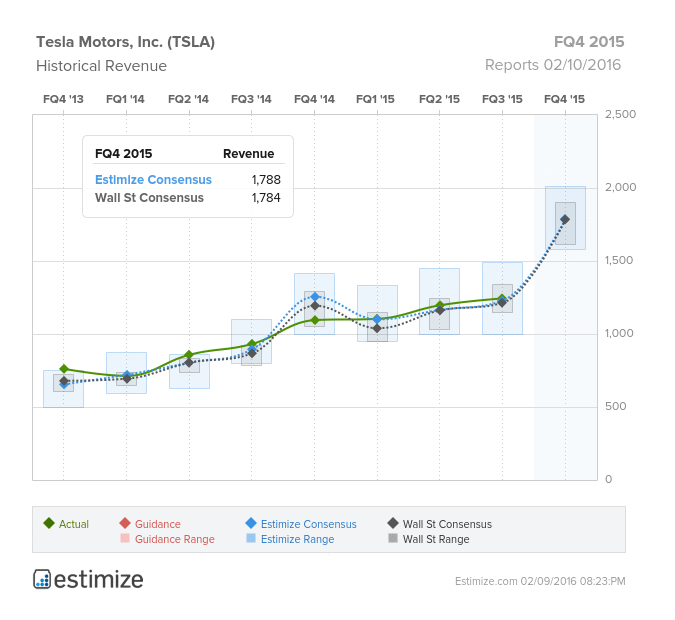 If the Model X SUV misses sales forecasts like the Model S sedan, it could have a crippling effect on the stock in 2016. As production ramps up, energy credits from green technology are expected to shrink proportionally to sales growth. Investors are more likely interested in forward-looking guidance out of Tesla tomorrow, than Q4 results. 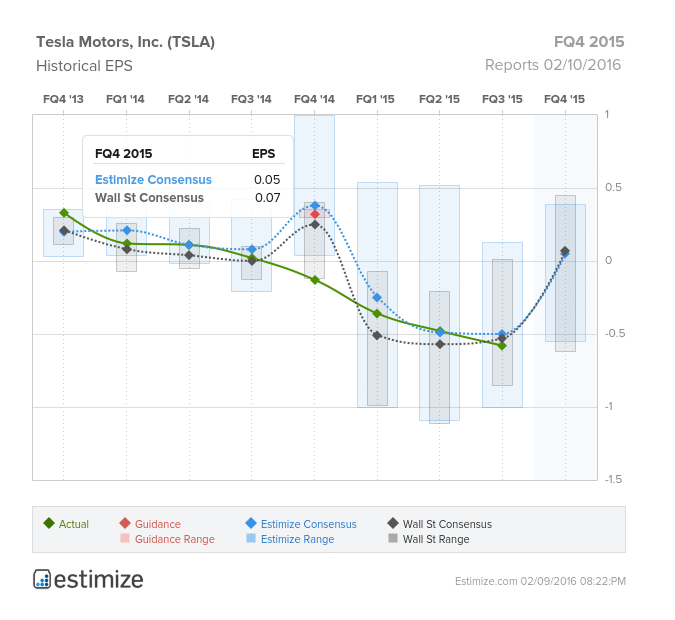 Do you think Tesla Motors Inc can beat estimates? There is still time to get your estimate in here!